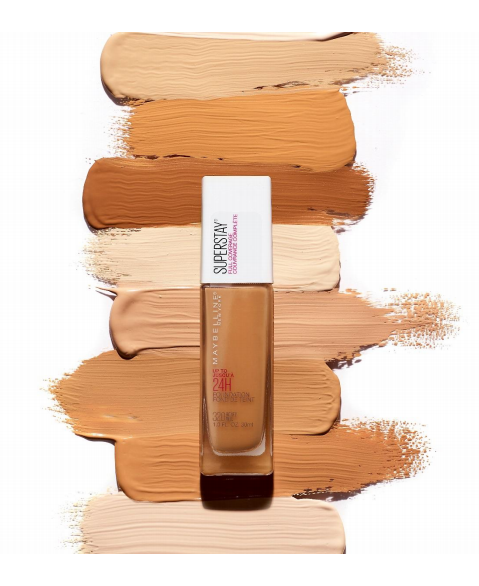 Maybelline Superstay 24H Foundation is reaching Singapore this June and will retail at Watsons, Guardians, SASAs, major supermarkets and hypermarkets, selected departmental stores as well as e-tailers where Maybelline has an official presence for $24.90 per bottle. The Superstay franchise has been buzzed about for a fair number of years now, and many of us in Asia - especially sunny, humid, tropical Asia - have been wondering for years why it never made it here. I'm a pretty big fan of several of the Superstay Matte Ink liquid lipsticks so it's ironic that the foundation from which they derived their name is only just coming into our market now. The good news is the formula is great. I've given it a good test run the past week or so, wearing it for full 10-12 hour days. It feels lightweight, is velvety and non-transferring to the touch, has medium-to-high coverage and is buildable to full, looks incredibly skin-like (when applied with a brush or damp beauty sponge), controls shine better than most other matte foundations I've used lately, and doesn't clog my pores. I took the shot above with just a single layer of foundation, no primer, no concealer, no powder. It does a good job of evening out discolorations and veins, even a lot of my dark circles, and almost completely covered recent acne hyperpigmentation scars on my cheek. What I like most is that it looks very real up-close and while it cuts shine and diminishes the look of pores, it doesn't look like a mask. You still see believable skin.